Denis was a missionary to Paris and he became the first Bishop of Paris. He had enemies and was imprisoned by Roman governor. Denis was martyred and legends quickly grew around his torture and death. One story recounts the body of Denis carrying his severed head away from his execution site. 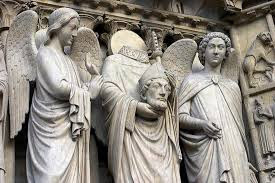 He was beheaded at Montmarte (mount of martyrs) and his corpse was thrown in the River Seine, but was recovered and buried later that night by his followers. Patron against frenzy, headaches, rabies & strife. Patron for possessed people.